Chocolate is one of Hawaii’s most delicious but unknown export products. It is a good souvenir to take home (chocolate covered macadamia nuts anyone!) and a very tasty snack that goes well together with a strong cup of delicious Kona Coffee. Hawaii is the only state where chocolate can be made with locally produced ingredients thanks to its tropical climate. The cacao is grown and processed on the Big Island, resulting in true, locally produced, American, chocolate! Recently cacao has become a more and more popular crop among small farmers, and some of these organize chocolate tours on their orchards. is known for their Kona Coffee farm tours, but they also grow cacao on their certified organic farm. You can join them for a chocolate candy making class, combined with a farm tour and tasting. Classes include unlimited chocolate tasting and a goodie bag. Reservations are mandatory at least three days in advance. See their website for details. offers tours on Wednesdays and Fridays at 9:00 a.m. Admission fee for adults is $15, children under 12 pay nothing (but do get to taste). The tour includes a one-hour walking tour of the orchard and factory full of information about every step in the chocolate making process. Reservations are required so call before you visit: (808) 322-2626. Organizes farm tours + tastings Friday thru Sunday from 10am to noon and from 2 to 4pm that cost $40 / adult (children under 12 free). The tour includes a view of their cacao orchard with over 400 trees, 1,600 white pineapple plants, turmeric, vanilla orchids, and lots of other cool stuff. Next to their own chocolate the tasting includes select chocolates from around the world, allowing you to experience how a particular region’s climate, soils and terrain affect the taste of the chocolate. They also share the history and roots of our century-old farm, and the history of the district of Hamakua. More information on their Website. 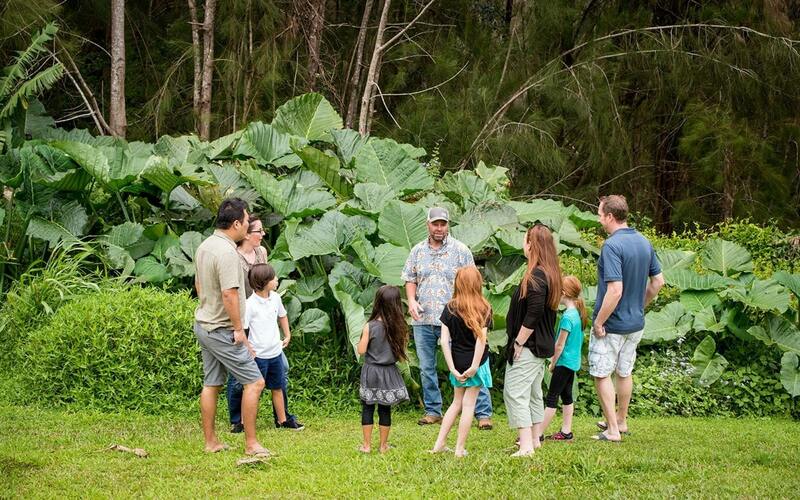 (near Pepeekeo, 10 minutes north of Hilo): Offers 90-minute farm tours every Thursday at 10:00 am and 1:00 pm. 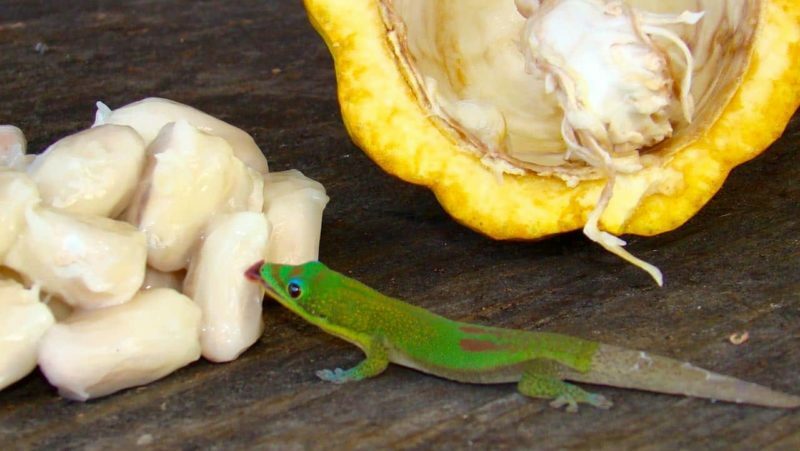 During the tour you will: See a working cacao farm with 1,500 cacao trees; Learn how award-winning cacao is grown, harvested, fermented and dried; Open a cacao pod and taste fresh cacao; Taste Hawaii Island’s “Best Cacao” from the Big Island Chocolate Festival; and taste Mauna Kea Cacao’s home-made (untempered) chocolate and commercially produced Hawaii chocolate from other bean-to-bar chocolate makers. More information on their website. A Cacao farm tour at the Honoka’a Chocolate Co. Next to a tour of the cacao orchard you also get to taste a variety of their own chocolate and other local products. Image credit: Sarah Anderson Photography. (in Papaikou, 10 minutes north of Hilo): offers personal walking tours of their farm where they plant cacao seedlings and from which they harvest and process cacao pods every month. Learn how they grow, harvest and process the cacao into chocolate, and enjoy free samples of our various chocolate products and 100% Hawaiian coffee. Reservations are necessary and are best made with a group as the fixed price for a tour is $180 (with an extra $10/person for more than 8 people). More information on their website. There are several producers on the Big Island that make chocolate from locally produced cacao and sell it. You can find this chocolate at local farmers markets, in any of the “Island Naturals” food stores, in most other convenience shops and even in the local boutiques in the island resorts. You can also order it online and/or ship it home through the website of “Original Hawaiian Chocolate“. Because chocolate and vanilla go so well together we’d like to point out that you can also take a tour of a local vanilla farm! Vanilla production is fascinating. The beans are the fruits of an orchid that only blooms for one day only, during which the flower must very carefully be hand pollinated. There is much more to learn about vanilla farming, and the Hawaiian Vanilla Co. organizes farm tours that can also include a lunch during which you can taste foods and drinks that include their vanilla. The Hawaiian Vanilla Co is located close to Honoka’a on the northern Hamakua coast. You can find more information about the tours on their website.